The US and South Korea have kicked off Foal Eagle, an annual joint military exercise that has been denounced by North Korea as a rehearsal for invasion. The exercise comes amid tensions in the region following North Korea’s recent missile test. South Korea’s Defense Ministry and the US military based in the South confirmed the commencement of the joint drills on Wednesday. 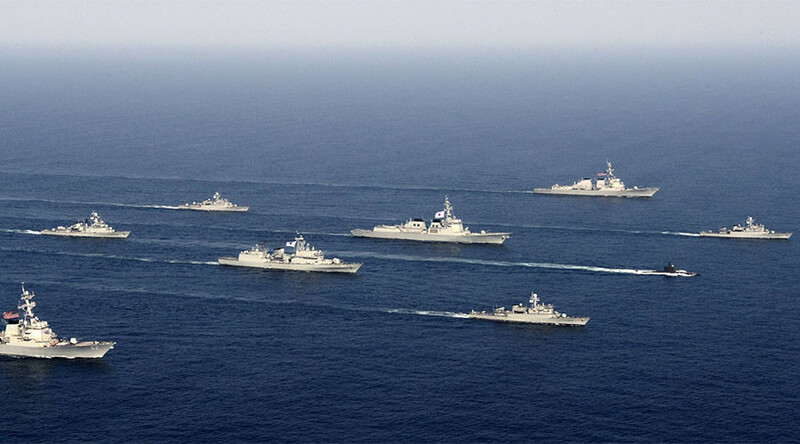 The exercise is a field training exercise involving ground, air, and naval forces from both US and South Korea that will run through the end of next month. The two allies are likely to deploy their major strategic assets in the drills to deliver a warning against what they see as North Korean provocations. In March, both countries also plan to separately conduct Key Resolve practice, a computer-simulated command post exercise, South Korea’s Yonhap news agency reported, citing the South Korean Defense Ministry. US Defense Secretary Jim Mattis and South Korean Defense Minister Han Min-Koo had a phone conversation early on Wednesday, in which Mattis expressed Washington’s commitment to the defense of its ally. “Secretary Mattis said that the United States remains steadfast in its commitment to the defense of [South Korea]. He further emphasized that any attack on the United States or its allies will be defeated, and any use of nuclear weapons will be met with a response that is effective and overwhelming,” Pentagon spokesman Captain Jeff Davis said in a readout, as cited by Yonhap. Mattis also welcomed the land-swap deal that South Korea signed with the Lotte Group on Tuesday of this week, which will see the South host America’s THAAD (Terminal High Altitude Area Defense) defense missile system. “This land transfer will support the alliance’s decision to station Terminal High Altitude Area Defense, a defensive weapons system, in ROK [South Korea] as soon as feasible. This is a critical measure to defend the ROK people and alliance forces against North Korean missile threats,” Davis said. The deal will see the Lotte Group trade its golf course for military-owned land near Seoul, South Korea’s capital. The golf course will become the future home of the advanced THAAD system, which is designed to intercept short, medium, and intermediate-range ballistic missiles during their terminal flight phase. Equipped with long-range radar, it is believed to be capable of intercepting North Korea’s intermediate-range ballistic missiles. Both Seoul and Washington claim the system is a defensive measure to counter Pyongyang, while Moscow has urged those involved to consider the escalated tensions it will inevitably cause. Beijing has also questioned the controversial deployment, with the Chinese Foreign Ministry once again reminded Seoul last month of its strategic “concerns,” stressing its “clear opposition” to THAAD’s deployment on South Korean soil. Some South Koreans have criticized the deployment as well. 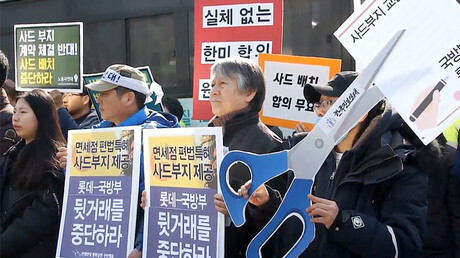 A demonstration was staged to protest the land-swap on Tuesday, and people living closest to the golf course have even filed a lawsuit against the South Korean Defense Ministry. South Korea aims bring the system online by the end of the year, with a military official saying last week that the deployment could be completed by August. In the phone call with Mattis, Han Min-Koo said that this year’s joint drills will be similar in scale to those held in 2016, which the South’s Defense Ministry called the “largest-ever” at the time. 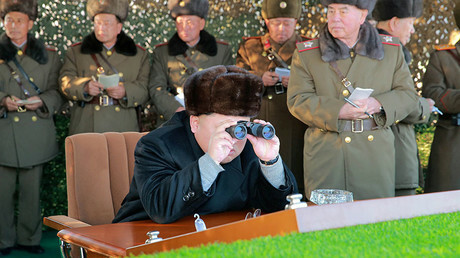 He also said the exercises, which have been held annually since 1997, contribute to peace on the Korean Peninsula. Both defense chiefs promised to monitor possible North Korean provocations and strengthen military cooperation in order to improve mutual combat-readiness. On Tuesday, North Korean leader Kim Jong-un inspected the headquarters of a major military unit and issued guidance on increasing combat readiness, Reuters cited North Korea’s official KCNA news agency as reporting. Last month, Kim Jong-un announced that his country’s military is capable of test-launching an inter-continental ballistic missile, warning that it could reach the US mainland at any time, from any location. However, US President Donald Trump has brushed off the threat, saying North Korea will never succeed in acquiring an intercontinental ballistic missile capable of that distance. The joint drills come amid increased tensions with North Korea following its test firing of a new Pukguksong-2 ballistic missile in February, which the state hailed as a major military achievement, but drew angry reactions from its regional neighbors and the US. Last year’s Foal Eagle exercise involved about 17,000 American troops and more than 300,000 South Korean service members. Although the two countries have held larger joint drills, these were the biggest war games conducted under the current format adopted in 2008 named Key Resolve/Foal Eagle. Last year drills prompted North Korea to order artillery drills simulating an attack on the residence of South Korea’s president, with Kim promising to turn Seoul “into rubble and ashes” if it challenges Pyongyang. North Korea rescinded its signature to the Nuclear Non-Proliferation Treaty in 2003 and announced its intention to build a nuclear arsenal, which it deems necessary for defending itself from the US and its regional allies, South Korea and Japan. The UN Security Council has passed several resolutions condemning Pyongyang’s development of nuclear weapons and missiles and has imposed economic sanctions on North Korea to hinder its programs’ advancement.